Pont Alexandre III is a deck arch bridge that spans the Seine in Paris, France. 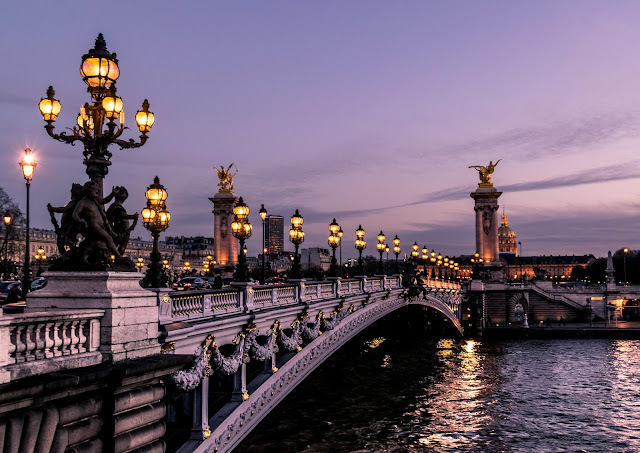 Because of its architecture and location, Pont Alexandre III is widely regarded as the most ornate, extravagant bridge in the city, and one of the most beautiful river crossings in the world. It connects the Invalides on the Left Bank to the Grand Palais and Petit Palais on the Right Bank. From the bridge you can enjoy a sweeping view of these buildings as well as the Eiffel Tower and over the Seine, which makes it a popular place for a stroll at any time of day or night. Pont Alexandre III was built for the Exposition Universelle, the world fair held in Paris in 1900. At its four extremities are huge 17 metre-high pylons. These four pillars provide stabilizing counterweight to the bridge’s arch without obstructing the view. The pylons are crowned with gilt bronze sculptures of winged horses representing the illustrious Arts, Sciences, Commerce and Industry.